Ants are black, brown, reddish, or yellowish and live in colonies. They have 6 legs, 2 elbowed antennae, and a constricted waist. Unlike wasps, the constriction includes the first few segments of the abdomen, the second of which has a raised node called a petiole (that term is also used for the stem of a leaf). The rest of the abdomen (the rounded hind part) is called the gaster. Ants have compound eyes and two powerful jaws (mandibles), which serve them just as hands serve humans. Within each colony are several different types of ants (castes), each with a different job. Most of the ants we see are workers. Sometimes we see males and queens, which have wings for their mating flights. Eggs, small grublike larvae, and pupae are often seen beneath upturned stones and other places where a colony is torn asunder. Similar insects: Velvet ants, other wingless wasps, and termites do not have elbowed antennae. Termites also do not have a constricted waist. Length: to 1 inch (varies with species). Ants are colonial and build nests in a variety of places, according to species. Many tunnel underground; others into rotting wood or leaf litter. Queens stay in the nest laying eggs for the whole colony. Workers wander far afield, risking their lives, searching for food. They leave a scent trail on the surfaces they’ve traversed. To return home, they retrace their steps, using scent-receptive organs on their antennae to smell their trail. Ants communicate with each other via scent signals. Some ants hunt live insects; some scavenge from dead or decomposing materials. Some raid other ant colonies. Some prefer sweets; others meat. Some eat seeds. Workers often form long lines between a food source and their nest. Some ant species form “partnerships” with aphids, which excrete a sweet fluid called honeydew. Ants protect and even herd their aphids, stroking them to make them produce the sweet droplets. Leafcutter ants grow fungus gardens underground, feeding the fungus with leaves. Common. Some are considered home, garden, or crop pests. Others provide important services in attacking injurious insects and aerating the soil. Many ants bite or sting defensively, though rarely seriously. 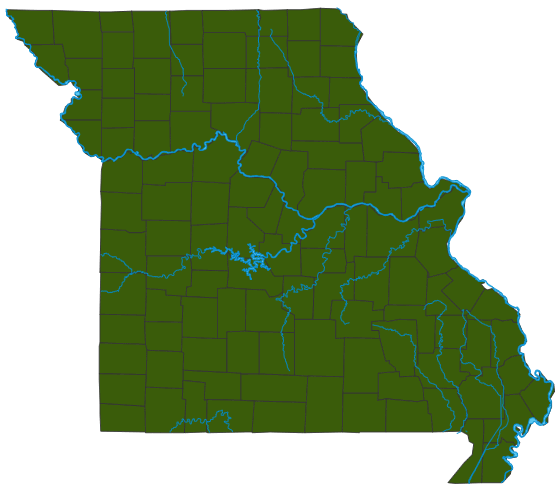 About four of Missouri’s ants are Species of Conservation Concern, and vulnerable to becoming extirpated from our state. Ants begin life as eggs, go through grublike larval stages, pupate, then are adults. The complexity of their life cycles is staggering: Because it takes a whole colony to reproduce itself, ant colonies are sometimes called “superorganisms.” Queens stay in the nest laying eggs, most of which become workers, which cannot reproduce. Some eggs become males and queens, which have wings; they fly and mate. After mating, the queens tear off their own wings, start digging, and create a new colony. Pest-control companies profit from people trying to get rid of ants, some of which can damage wood. Humans have introduced fire ants and other species to our country, disrupting ecosystems and harming people and property. As models of teamwork and industry, ants appear in stories and fables. Ants aerate soil and help decompose wood and other matter. Many plants require ants for seed dispersal. Some aphids depend on ants for protection and moving them to new food supplies. Many animals, such as flickers and box turtles, eat ants. To avoid predation, some spiders and insects mimic ants. Species in the genus Megachile.